Westall Secondary School in Clayton South, Melbourne, has started using KDE under KUbuntu Linux to allow them to replace the 3.0GHz Intel PC’s they were using with older 2.1GHz PC’s, extending their lives and avoiding landfill. The systems use KDE’s Kiosk framework to let the staff lock down the systems for their library system. The 3.0GHz machines released from this role will be going back into the main school for teaching duties there. In explaining why the school went for Kubuntu, Stefyn said the students responded well to CDs put out by the Ubuntu project. Many had tried Ubuntu at home, which led to a decision to provide a familiar working environment at the school as well. During our last hardware cleanout, we challenged the students to create the best Linux install and customization, and the winners would get to keep the hardware once it was decommissioned. 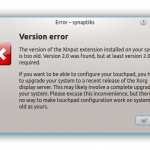 This entry was posted in Australia, KDE, Linux, Linux Users of Victoria, Security by Chris Samuel. Bookmark the permalink.